3 Common Car Buying Mistakes That Can Cost You Thousands! Last month I wrote a post where I gave 3 reasons why looking at monthly payments when buying a car is a huge mistake. I definitely think that this is the worst way to approach buying a new car; however, there are a few other car buying mistakes that can cost us dearly over the long run. I remember when a family member purchased an SUV that had an 8-cylinder engine, back when having an SUV was a status symbol. I cautioned her about the amount of gas that her truck would consume, but she still wanted it. It wasn’t long before those large gas bills caught up with her, and she was looking to either sell or trade in the truck! The worst part is that she only had one child, and rarely used the space – and never used the additional power of the engine! Something else that comes up a lot when I talk to people about their budget/expenses is the problem of buying a car that is very costly to repair. Many luxury vehicles (and some “standard” ones) require special training and/or certifications by the mechanic working on them. Also, many times parts are a lot more expensive, causing basic maintenance to become a huge burden. You also need to consider things such as the rate in which that make/model is stolen, the cost of insurance coverage, and maybe even the average resell value. Be sure to do your homework when shopping for a car. That way, you can be sure to factor all of these “hidden” car costs into your decision! It is a pretty well-known fact that once you take possession of a car, it depreciates (loses value) fairly quickly. That means that the second you drive it off of the lot, it’s worth less than when you bought it! 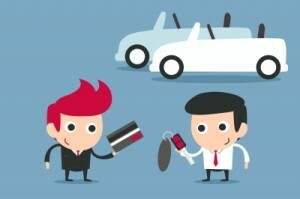 If, on top of the purchase price, you buy an additional service, spend extra for features that aren’t worth much to the average buyer, pay the tax and fees, all with borrowed money (whether you use a cosigner or not), that means that you are “underwater” (meaning you owe more on your loan, than the car is worth) as soon as you sign the contract! Failing to come up with a substantial down-payment is one of the biggest car buying mistakes that you can make, because you place yourself into a trap, from which it might takes years to recover! Your ability to sell or trade in your car will be almost non-existent, since you will owe more than it’s worth. Be sure not to get into an accident either, because your insurance company will only reimburse you up to the book value of the car! So many dealers try to push things on you after you have already agreed to purchase the vehicle. Things such as fancy floor mats, stain guard, rust-proofing, and even alarm systems can add thousands of dollars to the purchase price of your car, while not adding nearly that much in market value. Many times, 1 or 2 items/features that you want will be bundled with 7 or 8 more that you don’t really care for. This may cause you to pay an additional $2,000 for only $400 of value to you. Another thing to consider is that in most cases, you can get these additional services/features for much less than what your dealer is charging. I remember when my wife and I purchased our current vehicle the dealer insisted (over and over) that we purchase an alarm system through them. They wanted $600 for it, and we were blown away with such a high price; so we shopped around and ended up paying about $250 (with more features)! What I remember most about that experience is that we were told that the dealership simply outsourced their alarm installations to them. So they wanted to charge us $600 for a service which only costs them $250, and was right down the road! Make sure you research the individual options that you want, so you can be better informed when deciding what to get directly from the dealership. Most of the time you are paying a huge premium for the convenience. What are some of the biggest car buying mistakes that you have seen (or perhaps, made yourself)? How much time do you spend researching before purchasing a new car? What are some of your best car buying tips?